It’s time to replace your shower enclosure—what do you do now? Finding a new shower enclosure isn’t something most people put a lot of thought into until suddenly they need to make a decision. We’ll get the first thing you need to know out of the way right away: No, not all shower enclosures are the same. Like with any product, certain companies’ products are more reliable, better performing, and safer than their competitors, and knowing what to look for in a shower enclosure can save you a lot of headaches down the road. Here’s what you need to look for when searching for a new bathroom enclosure. There are a surprising number of companies that produce bathroom supplies, such as shower enclosures. One of the best ways to know you’re buying a good shower enclosure is to do a little research into the different manufacturers’ histories. If a manufacturer is offering their products at suspiciously low prices and only recently appeared on the scene, there’s a good chance they’re trying to sell you a substandard product. On the other hand, a manufacturer with a long history obviously makes products that are reliable and affordable enough to keep them in business for a long time. The Americans with Disabilities Act lays out guidelines for how showers and tubs can be safe and usable for people with disabilities. These guidelines are all about how to make showers and tubs safer and easier to use; for the elderly and disabled, ADA-compliant shower stalls are an essential part of their home. When choosing a new shower enclosure, check to make sure the one you are buying is ADA compliant, especially if someone with limited mobility will be using it. It shouldn’t surprise anyone to learn that some countries have less stringent rules when it comes to the materials that can be used in manufacturing, leading to some foreign-produced products to include materials that are substandard or even hazardous to one’s health. This is as true for shower stalls as it is for any other type of product, and it is something that you should definitely take into consideration during your search for a new shower stall. When it comes to shower and bath material, it’s always best to stick with products manufactured in the United States, where the materials and manufacturing process are more highly regulated than other countries. Looking for safe, high-quality, ADA-compliant shower stalls? 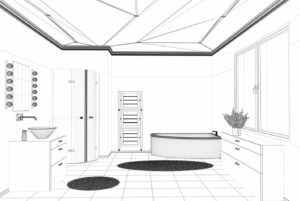 American Bath Enterprises, Inc. carries a large selection of bathtub enclosures and shower stalls that are produced in the United States and that stringently follow the guidelines set forth in the Americans with Disabilities Act. If you’re looking for a shower stall you can rely on, there’s no better source than American Bath Enterprises. Want to learn more? Give us a call at 888-228-4925 today or look through our website. We look forward to hearing from you!